(Jakarta, June 17th 2014) – Archipelago International has recently opened their latest Quest hotel, introducing the brand to the bustling city of Surabaya. With superior facilities at an affordable price, the hotel Quest Hotel Surabaya is set to become one of the best premium budget hotels in the area. Surabaya is Indonesia’s second largest city with a population of over 3,1 million. It is the capital of the East Java province and primely located on the northern shoreline. At the heart of the action, Quest Surabaya is conveniently located in the city's thriving business and restaurant district, situated on Jalan Ronggolawe. The hotel features 135 rooms and suites, combining the value of a premium budget hotel with a unique and inspiring design. For travelers seeking a stylish yet unpretentious environment, the hotel offers state of the art technology and creative hospitality concepts, including a restaurant, a café and lounge, an indoor swimming pool and a spa and fitness center. For business travelers, the hotel also offers six well-equipped meeting rooms. “Archipelago International is very excited to bring the Quest brand to Indonesia's second largest city. Following Quest's success in the Philippines in Cebu and in Indonesia in Semarang and Bali, we believe that this new location in Surabaya will become the preferred premium budget hotel in the city, bringing a breath of fresh air to Surabaya’s vast development portfolio. You can follow the brand's progression at our website www.QuestHotels.com – keep your eye out for the next Quest Hotel due to open in Balikpapan in July.” Said Norbert Vas, Archipelago International's VP Sales & Marketing. 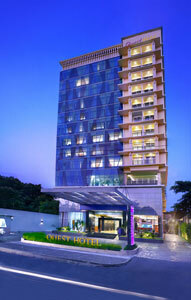 Seen in the picture - Exterior of Quest Hotel Surabaya. Seen in the picture - Standard Room of Quest Hotel Surabaya.